No disrespect for other instruments in the family, but there’s really nothing like a tenor sax as lead instrument in jazz. Its flavor is rich, its range exceptional. And in the hands of Pete Mills, it can make many a listener happy. 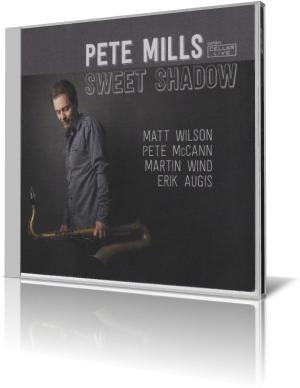 And it’s fresh with 11 original songs on Mills’ Sweet Shadow (Cellar Live Records, 2014). The project features Mills, Pete McCann on acoustic and electric guitars, Erik Augis on piano, Martin Wind on bass and Matt Wilson on drums. The set begins with vigor. “Shiner” opens with a bouncy lead by Mills with the accompaniment fully locked in. Mills says the song is based on the standard, “My Shining Hour.” One can almost feel the charm of a jazz diva, such as Kitty Margolis or Sara Gazarek crooning this one in front of a big band or small ensemble. Mills steps aside Augis and McCann to have a moment to shine. And they do, with plenty of action underneath by Wind and Wilson. “The Snagel” is a cool piece that sounds like a snack or breakfast food Mills would create if he could turn bagels and other delicacies into sound. It actually is named for a menu item at the Denison University coffee house, a favorite of Mills during an all-nighter. If the overall mood of the song isn’t enough, McCann adds a bit of his own flavoring during the middle solo. Mills comes back with a performance that serves up a few more treats to go along with the appetizer. The title song is a ballad. Mills plays the tenor softly. At times, the guitar unites with the sax, playing the same notes for a few phrases before harmonizing. Wind solos, accompanied only by subtle drums and guitar. It adds a nice touch. The group had some extra time, so as a bonus track, Mills added “Momentum,” the title song of his debut album. He and the gang got two takes on the song. Take 1 was included on Sweet Shadow. The 14-track session also has two covers. Mills is a native of Toronto. As a sideman, he appears on dozens of recordings and performs regularly in the United States and Canada. In his adopted hometown of Columbus, Ohio, Mills is a featured soloist in Byron Stripling’s Columbus Jazz Orchestra.